If success were measured by who we piss off, then we’re definitely on the right track with Attorney General Eric Holder’s staff memo telling the Justice Department not to stomp on Colorado and Washington for legalizing marijuana. Yes, indeed. A whole bunch of cops were royally pissed off. And they all signed an open letter to the AG voicing their displeasure. “Law enforcement becomes infinitely harder for our front-line men and women given the Department’s position,” they kvetched. The signature list reads like a flashback to a Las Vegas convention infamously attended by Dr. Hunter S. Thompson in 1971. It includes the Major County Sheriffs’ Association, the National Sheriffs’ Association, the Association of State Criminal Investigative Agencies, the International Association of Chiefs of Police, the National Narcotic Officers Associations’ Coalition, the Major Cities Chiefs Police Association and the Police Executive Research Forum. In Fear and Loathing in Las Vegas, Thompson describes the law enforcement gathering as “a crowd that was convened for the stated purpose of putting people like us in jail.” The same goes for the crowd who complained to the AG about allowing marijuana legalization to go forward in Colorado and Washington. This provides a certain bitter satisfaction, I must admit. But if you measure success by who gets left in the dust behind the administration’s so-called sweeping reforms, then there’s not much to celebrate. 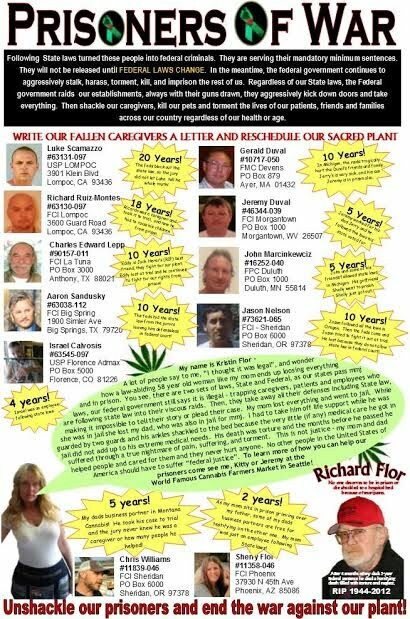 Richard Flor, Montana’s first registered medical marijuana caregiver, died in federal prison on August 30, 2012. A Vietnam veteran and medical marijuana patient, Richard Flor (68), who was suffering from diabetes, a heart condition, hepatitis C, osteoporosis, broken bones and colon cancer, died in federal custody at a for-profit state prison in Las Vegas, Nevada. He’d been warehoused in private prisons for six months awaiting transfer to a federal medical facility. He never made it. His daughter, Kristin Flor, is dedicated to exposing her family’s treatment by the justice system and to advocate for other “plant prisoners” currently in federal custody for providing, in compliance with state laws, a plant that heals. She describes her dad calling from prison, begging for help. He had a broken collar bone, a broken shoulder bone – eight broken bones in all. Her calls to the Prison Bureau and the Federal Marshall’s office went unanswered. “He lay there and cried out for help,” she said, her voice cracking. He had undiagnosed colon cancer and suffered intense stomach pain. “The nurses and doctors accused him of faking it. They just let him lay there with no health care at all.” After four months he was transferred to another private prison in Las Vegas. Kristin heard from her dad a couple more times and then she never heard from him again. It turns out he’d had two heart attacks and flat-lined twice in a prison hospital. He’d suffered for eighteen hours before she was called and told he’d been placed on life support. When she arrived in Las Vegas, they told her he wasn’t going to make it. He had been shackled every day while in custody. “What my dad hated about the shackles is he had all these broken bones!” Sometimes denied a wheelchair or a walker, he was forced to walk on broken bones. He eventually lost the ability to walk altogether, but they still kept him shackled. Meanwhile, Flor’s wife Sherry and son Justin were both given federal prison sentences for their involvement in the family’s state-compliant medical marijuana collective. Sherry was the book-keeper. Justin operated the dispensary and took care of the backyard garden. Kristin had to tell her mother by phone that she had taken her father off life support. Sherry’s request for compassionate release to bury her husband was denied. “Prison is no place to grieve,” she wrote. Try not to get tunnel vision looking for the problem. Keep working on the solution. Rather than sink into negativity, I will keep the words of my distinguished colleague, Mr. Martin, in mind. After all, the Obama Administration is allowing recreational marijuana. That shoots holes right through the DEA’s laughable opinion that marijuana has no medical value. So what? The president has opened the floodgates of policy reform for recreational marijuana, virtually inviting other states to do the same. There’s certainly some satisfaction in that. But real satisfaction will only come when our marijuana POWs are set free and law enforcement stops waging war on people they are sworn to protect and serve. So, in spite of the euphoria in some circles about the latest announcement, it’s hard to shake the feeling that there’s still a “million pound shithammer,” to use a phrase only Hunter Thompson could have come up with, hanging over our heads. Los Angeles attorney Allison Margolin suggested the AG simply start having his staff report to him weekly so he can keep a tighter rein on their activities. But until something like that happens, the raids will continue and more patients will go to prison. Opponents of legalization held their “first annual” National Marijuana Policy and Strategy Conference on September 23-24, 2013 in Rancho Cucamonga, California. Hosted by Paul Chabot of the Coalition for a Drug Free California and Calvina Fay of the Drug Free America Foundation, among others, it featured speakers from Citizens Against Legalizing Marijuana (CALMca.org), the Marijuana Eradication Task Force, DARE, Nip It In The Bud USA, the former Assistant U.S. Attorney who organized the Crime/Drug Enforcement Task Force, and the lead expert on marijuana dispensary litigation in the case of Riverside v. Inland Empire Patients Health and Wellness Center. That’s the landmark ruling by the California Supreme Court allowing cities to ban medical marijuana dispensaries. The host and speaker list was long and represented, once again, a crowd convened for the stated purpose of putting people like us in jail. I’m not here to burst any bubbles – we have gained tremendous ground. But before we declare victory, let’s remember that we’ve been here before. And it’s why we lock up people like the world’s oldest living hemophiliac, Dale C. Schafer (61) – a legitimate, card-carrying California medical marijuana patient. Schafer is also an attorney, former candidate for District Attorney of El Dorado County, and husband of fellow incarcerated medical marijuana patient, cancer survivor Dr. Mollie Fry. He could have been spared years of unremitting hell. But no. When we first checked in, Dale Schafer was five excruciating months into a five-year mandatory minimum sentence. He was suffering “pain like a toothache” from multiple bleeds into his weight bearing joints. He also suffered from five herniated disks, failed back surgery, degenerative joint disease, spinal stenosis and severe arthritis in virtually every joint. From the day he entered the system at Sacramento County jail on May 2nd, 2011, Schafer had been moved from one prison to another while being systematically denied medication for his constant pain, which on most days reached level ten on a scale of ten. Schafer had been on a carefully monitored pain management program with his hematologist until he and his wife, cancer survivor Dr. Mollie Fry, began serving federal prison sentences for conspiracy to manufacture and distribute marijuana. The lawyer and the doctor turned themselves in on May 2nd, 2011, to serve federal prison sentences for providing patients with medical marijuana according to California’s Compassionate Use Act. They ran a medical marijuana collective in full compliance with state law and with the full knowledge of local law enforcement officials. They also had a backyard marijuana garden, where they grew no more than forty-four plants a year – well under the legal limit of ninety-nine plants. Had they been allowed an affirmative (medical marijuana) defense in court, the jury would have known all of that, and may have ruled differently. But theirs was a federal case where state medical marijuana law does not apply. When a defendant is denied the right to tell the whole truth by the court itself, how can justice even begin to be served? This is one problem desperately in search of a solution – whether it takes an act of Congress or an act of God. At this point, smart money is on God. When people are raided for doing something they were encouraged to do by the government that raids them, that’s classic whack-a-mole. Too many people found out the hard way that no matter what you do to comply with the law – no matter how many lawyers you hire, no matter how righteous you are – you’re still wrong. If they want you, they will get you. On May 27th, 2011, Schafer’s daughter Heather and son Jeff, struggling to manage the chaos of their disrupted home life (all five kids from Mollie and Dale’s blended family, two grandchildren and one on the way, were living together in their parents’ home) told us their dad was in San Bernardino County jail, notorious for a twelve-hour riot in 2009 in which over 300 inmates were injured. They emphasized that he was in the general population with no prescription pain medication. Again, Eric Holder’s memos have done nothing to help current non-violent drug “offenders,” also known as medical marijuana dispensary owners like Aaron Sandusky, who is serving a mandatory minimum sentence in a federal prison in Texas – with a heart condition and an undisclosed injury. But I digress. After about two weeks in Sacramento County jail, according to a blog he later posted, Schafer was transferred to San Bernardino County Central Detention Center. He’d endured a bus trip that took over twelve hours, on hard plastic seats, with no pain medication. Once at San Bernardino, he received no pain medication for another four days. By then he was suffering from withdrawal as well as his untreated pain, and still had not seen a doctor. At this point he was in the medical ward, although still in the general population, waiting to see an outside pain management specialist to determine his “true need for narcotics.” He was also waiting for transfer to a federal prison facility. Given his experience so far, he didn’t bother to give out the San Bernardino County address, knowing he could be transferred any day, at any time. It took another four days before he was given Tylenol with Codeine. His family sent medical records and he complained in writing several times, but the prison doctor refused to prescribe anything stronger, or even talk to him – so he started a grievance process. 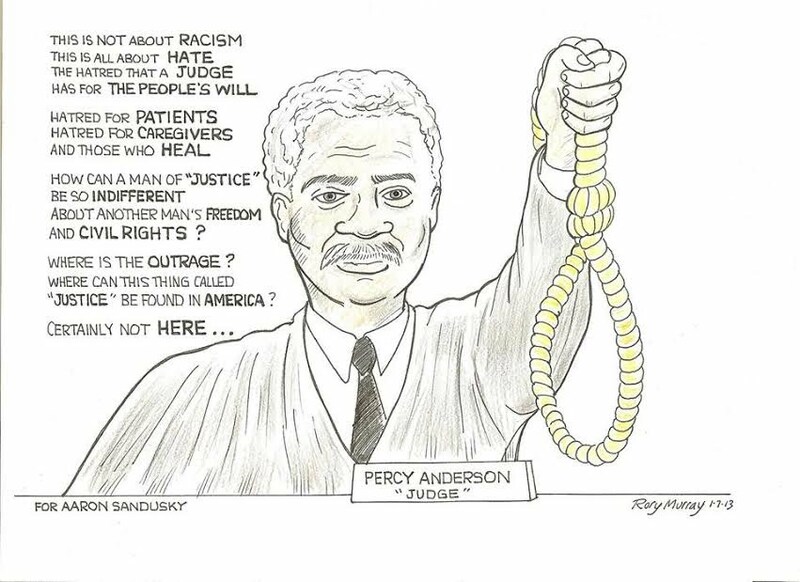 “The whole system is barbaric,” he wrote. “If the nurse announces pill time and you don't hear it, they leave without giving you your meds. There are several diabetics who have missed their insulin because you can't hear the pill call person.” When Schafer started whistling to alert the other inmates, the guards made him stop. Upon hearing of Schafer’s latest address change, former medical marijuana POW Tom Kikuchi remarked that he was being subjected to “diesel therapy." 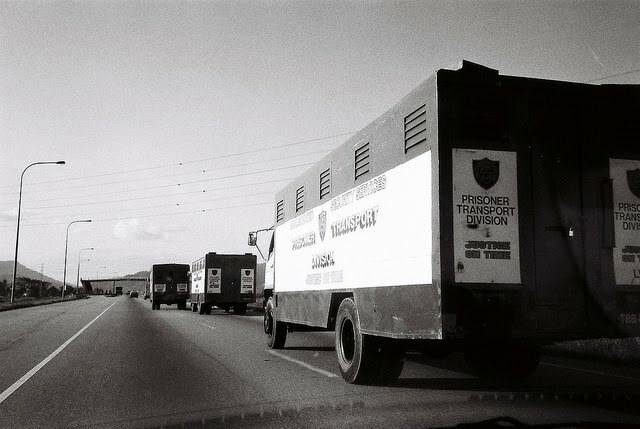 A form of punishment, prisoners subjected to diesel therapy are shipped on buses over a matter of days or weeks, during which time they have no address at which to receive mail, no personal property, and no access to the commissary system for paper, stamps, vitamins, toiletries or staple foods such as nuts and canned meat. They also can’t order their prescription meds. Because the bus engine is never shut off, the inmates inhale diesel fumes the whole time they’re on board. As a prisoner of the drug war who served four years in federal prison for cultivating medical marijuana, Tom Kikuchi is familiar with the middle-of-the-night wake-ups to travel to yet another unknown facility. For security reasons, prisoners get no warning when the next leg of travel will occur. With no idea how long he would be shackled without access to a bathroom, he would never ingest more than a few sips of water a day. He explained that local jails get paid a daily rate to house federal prisoners in transit. For example, in 2008 the “cost per offender per day” in Oklahoma was $58.02. The projected cost for 2010 was $62.34; another two bucks a head in 2011, and so on. “Communities build oversized prison facilities and then get on the government dole to pay for them,” said Kikuchi. Prisoners are shipped on “circuitous routes” around the country to keep those facilities funded. But it was Tom Kikuchi who witnessed the ultimate in prisoner abuse: He saw an inmate die right in front of him for lack of medical care. Once the body was rolled away, the other inmates heard about the dead man’s heart condition (remember Aaron Sandusky? In a federal prison in Texas, injured, with a heart condition — to this day?) and about his many trips to the prison infirmary with severe chest pains. He had repeatedly been given aspirin and told to come back. Assigned to the prison gardening crew, he had never been allowed to rest. For two months this went on, and then he was dead. Obviously one solution to these grotesque prison conditions, at least in the case of California where the governor was ordered by the United States Supreme Court to reduce the state prison population by some 10,000 people, would be to release non-violent drug offenders, particularly the sick and elderly. Instead of complying with the Supreme Court mandate, Governor Jerry Brown asked for a three year delay. Without a delay, he threatened to spend $315 million per year sending inmates to overcrowded county jails and private, for-profit prisons owned by the likes of Corrections Corp of America (which we exposed in a previous Dispatch. Most disturbingly, Governor Brown has stated that the best health care some prisoners ever get is in prison – while patients, gardeners and caregivers suffer and sometimes even die there. As of September 22, 2013, Dale C. Schafer, inmate #15839-097 has been transferred to a half-way house in Lompoc, California, with a projected release date of September 8, 2015. He never should have been imprisoned in the first place. Besides the early release of non-violent drug offenders, and a mandate for federal judges to allow an affirmative defense in medical marijuana cases, certain biased judges need to be flushed off the bench altogether. In Aaron Sandusky’s case, judge Percy Anderson was so rabidly biased against medical marijuana, he accused Aaron’s court supporters of being degenerates as he handed Aaron a mandatory minimum sentence of ten years in federal prison. Aaron Sandusky, inmate #63038-112 is still sick and hurt somewhere in the Federal Correctional Institution in Big Spring, Texas, located midway between Dallas and El Paso. His release date is May 8, 2021. If he lives that long. Again, he probably wouldn’t be there if a medical marijuana defense had been allowed in court. Or if the Attorney General’s new sentencing guidelines had been in place when he was charged. The least the AG could do is make them retroactive. Under the AG’s new guidelines, announced on August 12, 2013 in a speech to the American Bar Association, "certain low-level non-violent drug offenders who have no ties to large scale organizations, gangs or cartels will no longer be charged with offenses that impose draconian mandatory minimum sentences," he said. That sounds promising. However, under the new guidelines, although prosecutors may not use the weight of drugs seized in a raid to trigger mandatory minimum sentences, they are merely advised to exercise discretion in filing charges. In the end, the power is still in the hands of the prosecutors. lenience, is still great and terrible power." Upon learning that the cannabis crowd would honor the spirit of Dr. Hunter S. Thompson by “attending” the big anti-pot conference, the narcotics law enforcement groups released a decoy location change announcement to attempt to deter the sign-waving, slogan-shouting demonstrators. It didn’t work.